As we grow older, our bodies begin to go through several changes. While some of these new experiences are very enjoyable, others may require special attention to keep from being an issue. When it comes to oral health for the elderly, several risk factors come into play that need to be taken care of to minimize dental complications. 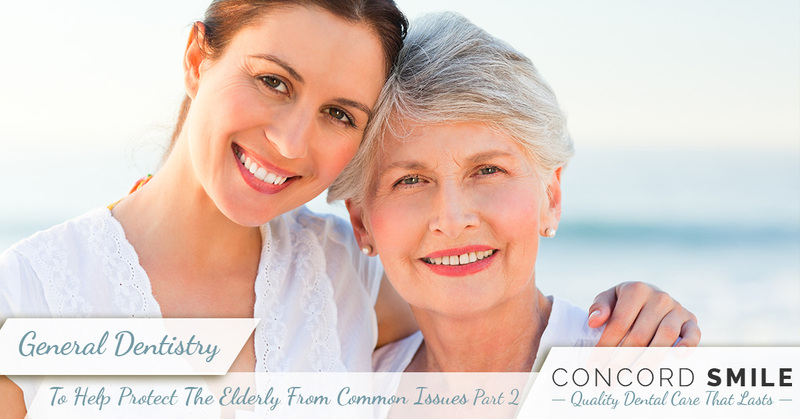 Last time, Concord Smile looked at a few common issues that senior citizens face when dealing with oral health problems. As Concord’s general dentistry experts, our professional family dentists are able to provide comprehensive services to optimize your overall health. Today, we’ll look at a few more serious problems that can be rectified with proper intervention and care techniques. It’s important to remember that your oral health affects nearly every other part of the body, and those with dental diseases will have a hard time regaining their optimal wellness. As we age, our senses begin to wane. Elderly citizens who have noticed a decrease in their eating habits may need to consider the possibility that their taste buds are diminishing. While the natural cause of this phenomenon has no explanation, other factors such as gum disease and medication complications certainly make matters worse. Working with your local dentist can help to treat many of the oral issues that are causing taste loss. Beyond this, there are numerous methods for making food more enjoyable, from trying new spices to incorporating social functions into eating and more. One issue affecting many elderly residents is stomatitis, a medical concern that is caused by their dentures. Essentially, poor oral hygiene or ill-fitting dentures cause inflammation around the areas that come into contact with said dentures. Stomatitis is often discovered when canker sores or cold sores are present, both of which can be very uncomfortable and detrimental to your dietary habits. When progressed far enough, stomatitis can also affect a person’s ability to sleep and talk as well. Our experts can perform a full dental exam to pinpoint this issue and offer the proper solutions to help you regain control of your oral health. Also known as thrush, this condition occurs when the fungus Candida albicans builds up within your mouth. This normally harmless organism can become very troublesome when overgrowth occurs. From lesions on the tongue, gums, or even further, thrush can be a troublesome issue. The elderly are especially at risk for this problem, especially if they possess a weakened immune system. As a yeast problem, thrush can be treated with a number of antifungals to help patients gain the edge against candidiasis. Elderly Californians are at a much higher risk for developing oral health complications. It’s crucial to be proactive in maintaining your dental health in order to avoid long-term problems. Regardless of age, we are here in Concord with general dentistry services to meet any need you may have. From stringent dental exams to wisdom tooth extraction and more, our dental experts are here to help. Contact us today to schedule your exam and be ready to smile with our quality results!